Reimagining the utility service experience when something goes wrong – Let's design a better future, together. SA Water’s delivered a consistently high rated services through its on-site in-bound contact centre. However, a growing by number of customers were requesting digital self-service options and better, more proactive communication when something went wrong. This included disruptions to their water supply and waste removal as well as issues like leaking meters or burst pipes. SA Water needed to find a way to replicate the fantastic service provided in the contact centre within a digital environment and improve the real-time communication it delivered to customers. The driver to improve these services came initially out of SA Water’s Digital Strategy Program submission to the economic regulator. My role started as author of this strategy and the business cases that supported it and then unfolded as Product Manager and Customer Experience lead. I worked with UI/ UX Designers (mostly external contractors), SME’s and business leads across the business. Once solutions were defined they were mostly handed over to digital project teams and external contractors who undertook further UX/ UI design, software development and project delivery. At this time SA Water hadn’t yet adopted a fully agile approach to project delivery so one of my challenges was bringing user-centered design into an established, and complex waterfall delivery methodology. Fault reporting and resolution was a complex process and involved multiple teams, legacy systems, process and technology to work seamlessly together. There was a risk, due to this complexity, the project would fail before it even got started if it was tackled in one hit. To reduce this risk I broke it down into two core problems that we needed to solve. How might we create an online fault reporting services that replicated the things people love about talking directly to call centre staff? How might we deliver real-time fault notifications so customers have the latest information on issues impacting them? We assumed customers would be happy to report all faults online – this was not the case. The more severe the fault the more they wanted to speak to a real person. Based on this insight we immediately deprioritised online fault reporting for severe faults including large water main bursts or any issue that could damage buildings or injure people and animals. Another big insight that came up was around the need for choice – rather than just picking one channel to deliver alerts, customers wanted to be able to choose the one that suited them. Customers also saw faults differently to SA Water. Metal plates or fireplug leaks were deprioritised by SA Water due to minimal risk and water loss whereas customers educated during drought to be worried about any wasted water were distressed seeing these leaks unattended. We need to define 2x beta services to go live with – one for reporting faults and one to better communicate how we were managing faults. Our form UX was based on guidance from the UK’s Government Digital Service however, to increase accessibility and understanding for our diverse audience, we added in images as well as text to describe different scenarios and equipment. The end-result was a simple, really easy to use and helpful form that guided user through each step (visit it here). To enable these new services to be developed we also to get the supporting systems, processes and people to better integrate. I coached and supported the digital team to lead their first journey mapping workshop with staff from across the business including operations, digital and customer services teams to identify how the new services would work, what processes needed to be changed and how the impacted teams might be trained. We then redesigned workflows and processes between teams to enable the change and invited them to provide ongoing feedback on what was/ wasn’t working. Our initial annual targets for customer migration to the new fault reporting and notification services were exceeded in the first six months after launch. Take up of online forms for reporting leaking meters was the most successful of these services with 35% of all reports coming from the website after 6 months. 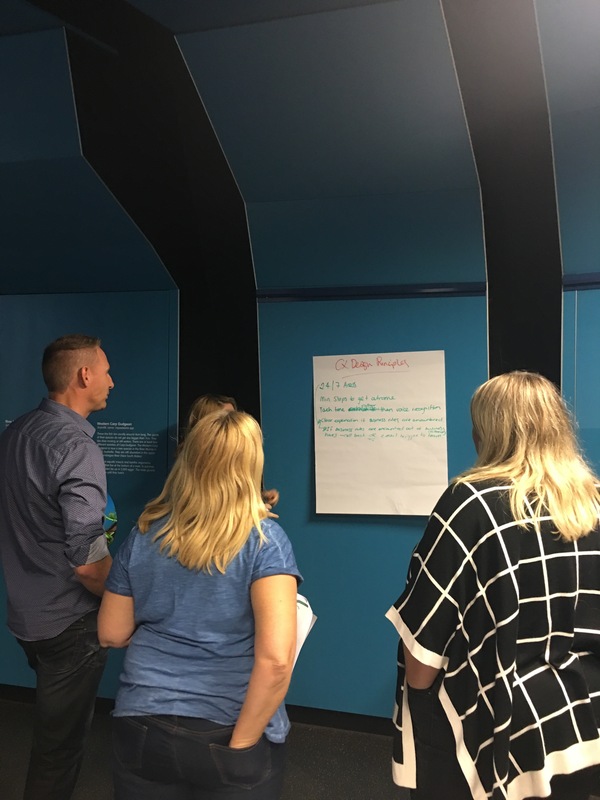 As part of a broader program to introduce user-centered design to SA Water, this project helped bring front-line staff and internal project teams together to ‘do design’. I coached the digital team to take over facilitation of journey mapping workshops for the first time and supported them in an advisory role to apply design tools. By the end of this project the business leads were comfortable engaging customers, interpreting their insights and were proudly advocating the importance of a human-centered design approach.